The main house at Olana, sited impressively at the top of a long slope, is a unique mixture of Victorian architectural elements and Middle-Eastern decorative motifs. 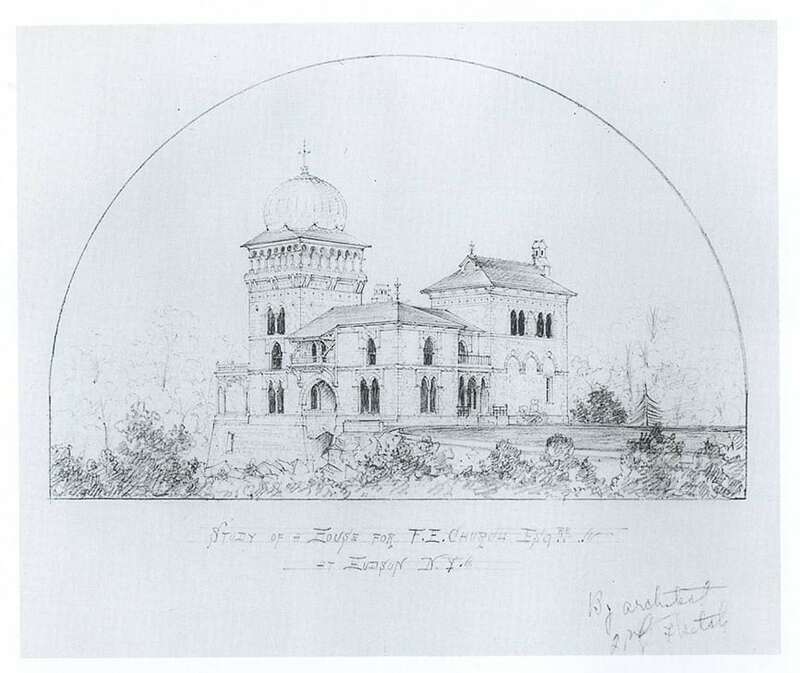 Frederic Church worked closely with architect Calvert Vaux to realize this distinctive home. Stylistically, the building is a villa with asymmetrical massing of towers and block masonry punctuated by fanciful windows and porches. The irregular silhouette of the exterior contrasts with the more regular rhythm of rooms arranged around a central hall. On the exterior, Middle Eastern motifs are carried out in colored brick, wood, slate, ceramic tile and especially stenciling. Together, the various motifs and themes create a unique artistic unity, one that is difficult to categorize. In the fall of 1869 Frederic and Isabel returned to America from an 18-month-long trip to Europe and the Middle East. While living in Cosy Cottage they decided to build another house – one that was much larger and more permanent. Impressed by the architecture they saw in cities like Beirut, Jerusalem and Damascus, they envisioned a home that incorporated Middle Eastern elements and designs. 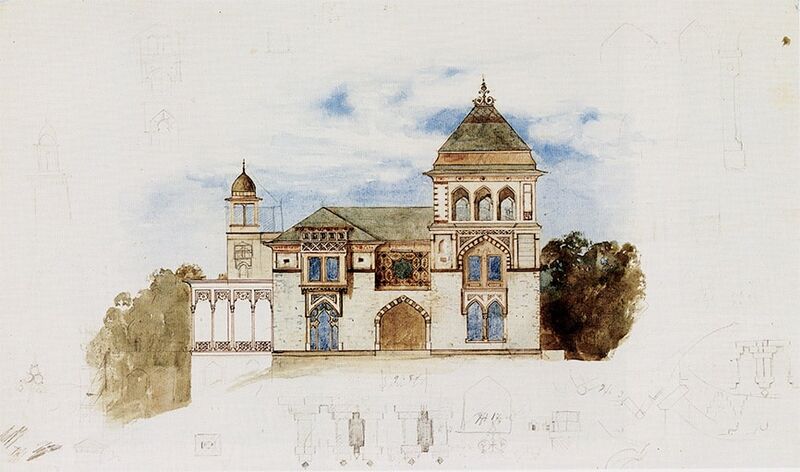 Drawings by Richard Morris Hunt document that Church considered using him as an architect, but ultimately he decided on Calvert Vaux, who was then designing Central Park’s buildings. Vaux had professional qualifications and personal ties to the Church family. He was the author of Villas and Cottages (1857) a pattern book for rural domestic architecture. And, Vaux’s wife Mary was the sister of Jervis McEntee, a close fried. Church spent about two years working with Vaux. While the exact contributions of the two are unclear, Vaux probably was responsible for structural elements, while Church devised myriad ornamental elements. It is believed that both, probably with Isabel Church’s input, sited the house and its many windows to frame the magnificent views. In the fall of 1872, the family moved into the second story of the new house while the decoration of the first floor continued. Church chose the color scheme for the house, mixing paint on his palette, then instructing his workmen on how to mix the colors. Eclectic furnishings soon filled the house, gathered from the long trip abroad, from shops in New York City, and even from a missionary in Persia. The thousands of objects and the painted décor evoke the great civilizations of the past, and present a rich contrast to the natural world visible through the windows. Church continued to work on the house for much of the rest of his life. In 1885 he began a campaign to repair and improve the house, and in 1888 began the studio wing, with guest rooms below and a glassed-in observation room in the tower. By 1891, the house was essentially complete, looking much as it does today. Church playfully called his house “Persian, adapted to the Occident.” Indeed, he and Vaux retained the concept of a Middle Eastern house: a compound of stone rooms built around a courtyard. In deference to the Hudson River Valley climate, the court is roofed and the windows are glazed. Many details are adopted from Middle Eastern sources, including arched window openings, balcony woodwork, and tile work. In overall form, however, the house resembles other 19th-century villas, with joined blocks of massing in picturesque fashion, a corner tower, and a mansard roof with pronounced cornices. 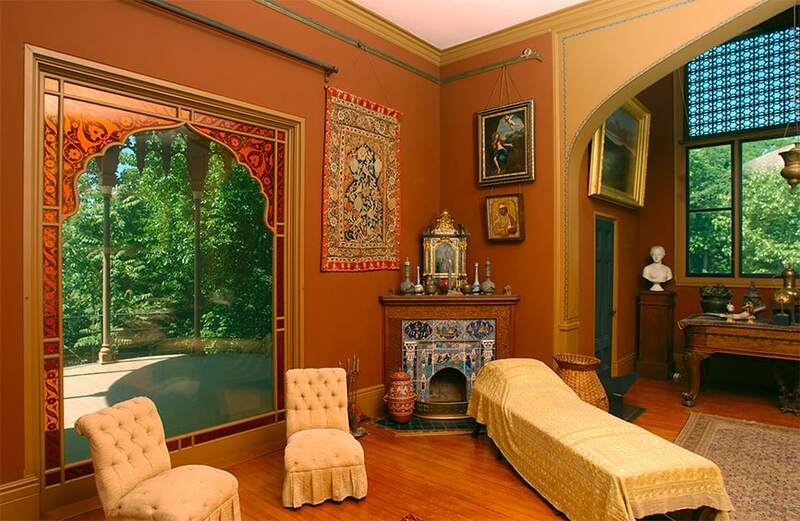 Thus, the house at Olana is both “Persian” and western. 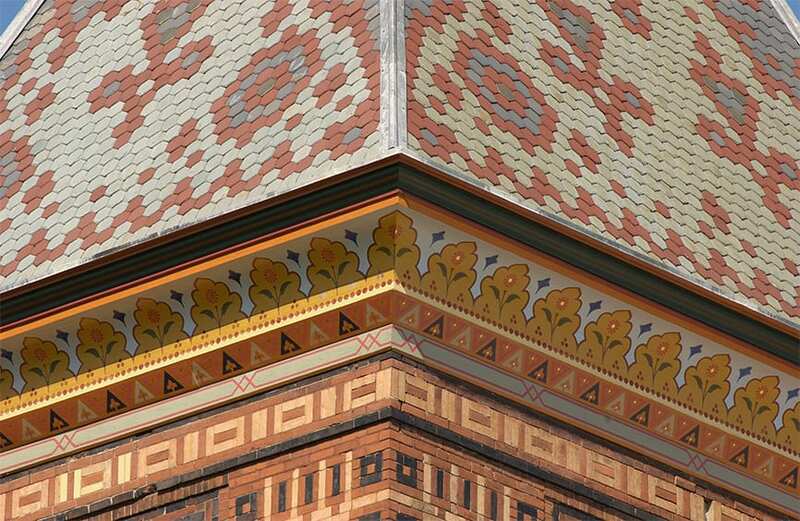 The main house at Olana is ornamented with stencils, inside and — most extraordinarily — on the exterior cornices. Church designed these stencils, and they are a major contributor to the Middle Eastern flavor that the Churches sought for their home. Hundreds of pencil and oil sketches for the stencils by Frederic Church survive at Olana, as well as the stencils themselves, with the original paint colors still on the edges. Church drew inspiration from several scholarly, large-format illustrated books that documented the architecture of Arab lands. He often translated the tile work, metalwork, and stone-carving of Islamic mosques into stencil patterns. At least twenty colors are used in the stencils, including gold and aluminum. The metallic pigments have oxidized into a soft bronze and grey, but originally the stencils appeared to be interlaced with gold and silver tracery and medallions. While many American houses have stencil work, few have any as elaborate as Church’s, and fewer still have exterior stenciling; none that can match that seen at Olana. Except for limited repair work, the stencils on the interior of the main house have never been painted over, although they have been cleaned; the best method is light rubbing with a Pink Pearl eraser! Not surprisingly, the exterior stencils degraded with the effects of rain, snow and sunlight. By the 1950s, the patterns were barely visible, and the cornices were painted brown. Using a combination of archival documents and photographs and detailed analysis of a cross-section of each of the five original cornices, the exterior cornices were repainted in 2004-2005. View of the bell tower, showing decorative brick work, stenciled exterior cornice, and colored slate tiles of the roof. Photo by Andy Wainwright, 2004. The studio, in the main house at Olana. Photo by Andy Wainwright, 2004. Beyond the stencils ornamenting the interior and exterior, the main house at Olana has a number of ingenious architectural details. Chief among them are the many arched window and door openings that frame the views. Some windows are bordered with amber glass, giving the appearance of a frame around the view. The window lighting the main staircase faces north, and has no view. To make the most of this situation, Church devised a pattern of cut paper that he sandwiched between panes of amber glass, thus imitating a mashrabiyya (a carved wooden screen found in the windows of many Middle Eastern houses) and introducing golden light to the Court Hall. There are numerous other idiosyncratic features, such as patterns of colored bricks, and Chinese tiles forming a balustrade railing. In mid-1880s, the Churches started incorporating the products of a workshop that Lockwood de Forest had established in India. The house now stands as the most important repository of de Forest’s work in the United States, with four mantelpieces, a balustrade, and numerous examples of painted and carved furniture.